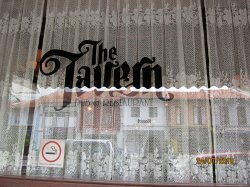 The Tavern Restaurant , located along the shophouse of River valley road, offers Swiss & Continental cuisine. It has been there for 6years! The Tavern is a resturant well-known for it’s excellent Traditional European food and of course it is one of the restuarant that the rich and famous would frequent. However or sadly, I am not one of them. The decor of the interior adopts a Traditional style and ambience. They divide the restaurant into 2 to occupy more tables. The cosy restaurant seats 100 persons and has a private rooms on the second level that is usually used for private functions. The menu is not printed in a form of a menu booklet but instead, the dishes are written on a chalkboard where the service staff would push the menu board over to you to have a look. Starters, mains and desserts are written on different chalkboard thus it makes it easier for reference and placing orders. I personally feel that the dishes are priced on the higher side (even more ex than other popular restaurants) . The starters are priced $18 and above thus expect to pay around $50 per person here. They do offer a 1 for 1 set lunch ( for DBS / POSB Credit card holders) priced at $60++. I would strongly recommend to go for the set lunch as it is much more worth it . I believe that it is the quality that matters and thus if you don’t mind forking out extra $ , order some of their signature dishes. The restaurant signature dishes are Pan fried goose liver ( Foie gras), scallop carpaccio and the Raclette cheese. Definitely one of the best I’ve tried so far. 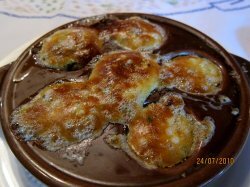 The escragots ( snails) are cooked with their home-made garlic butter and baked till perfection. The home-made garlic butter smells fragrant and they added some minced onions to it. The escargots are huge , meaty and succulent! 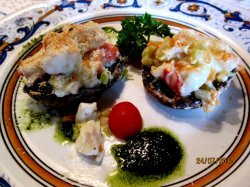 The portobello mushrooms serve as a light appetitizer. 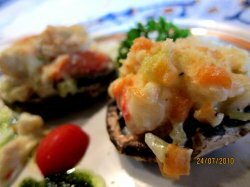 2 portobello mushrooms topped with fresh carbmeat (crab leg), cubes of carrots , minced onions light mayonnaise dressing and finish off with pesto sauce. The crabmeat was fresh and sweet and they were pretty generous with the crabmeat. Portobello mushrooms were juicy but I find the size a little too petite. Verdict: Other than the pricey factor, there is no reason why I should not make a return. The food is good, service is good, ambience is good but the price… not very good !